Hey guys, I’m officially back from vacation! Boy was it nice to get away. We went up to my brother-in-laws lake cabin. We’ve been going yearly for about 4-5 years now. Always such a relaxing and fun time being with family fishing and grilling and going out on the water. But I’m happy to say that I am home. Every one is supposed to plan a meal when we go up there. My husband and I chose to do my beer brats where you can find here, stuffed mushrooms and this amazing salad. Now, I have never tried quinoa before, I am a quinoa virgin. I have to say, this salad was absolutely amazing. The mix of the corn, black beans and cilantro gives it a refreshing taste. 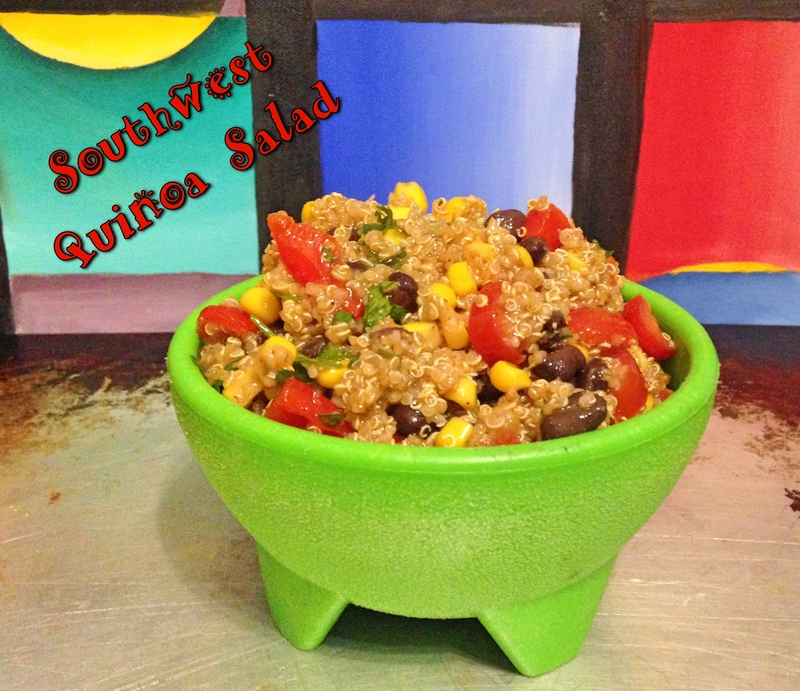 Couple with a chili lime dressing which kicks it up a notch and makes this truly have a southwest flavor. Drain your black beans and corn and rinse. Place into large serving bowl. Add your bell pepper, tomatoes, onions and cilantro and toss together. In small bowl, mix together the olive oil, lime juice, pepper, garlic powder and chili powder. Pour over the veggie mix and stir well. Add the quinoa and stir to coat and incorporate. Sprinkle with salt to your liking. This was very good and so refreshing! Thanks for visiting.